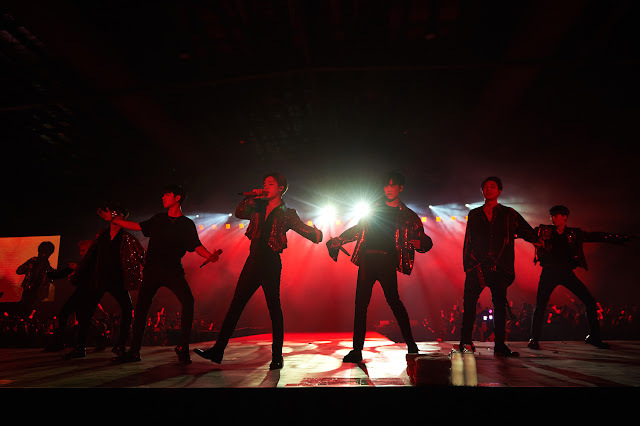 iKON consisting of 7 members - Kim Han Bin (B.I), Kim JinHwan(Jay), Song Yun-Hyeong (Song), Kim Jiwon(Bobby), Kim Donghyuk (DK), Koo Junhoe (Ju-ne) and Jung Chanwoo(Chan) returned to our beautiful merlion city with their 'iKON 2018 Continue Tour' over the weekend. It was an exciting evening as you can see iKONICs (their fandom) anticipating the start of the concert with their Konbat in hands. 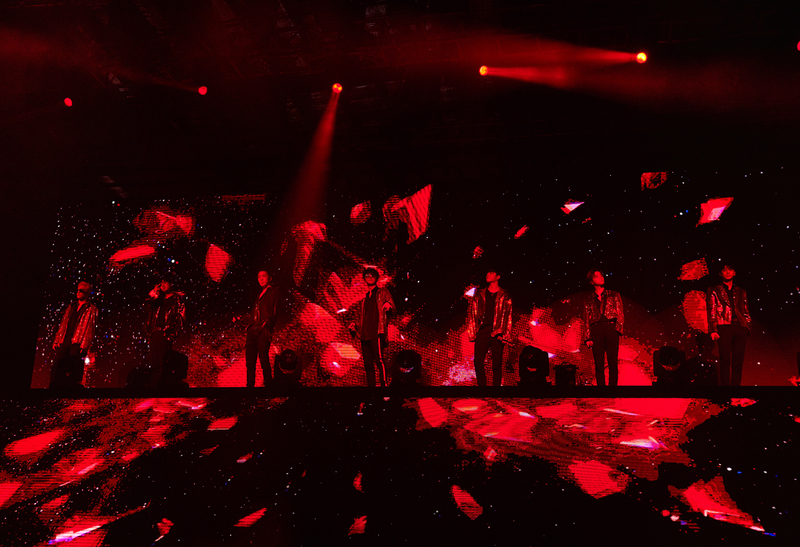 Fans are instantly captured by their charismatic visuals as they appeared on stage! 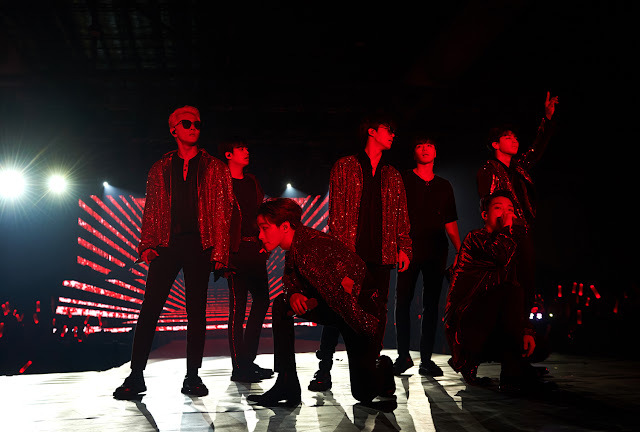 iKON looks so charming in their red suits as they hyped up the crowd with their first song 'Bling Bling'. It was really hard not to move along with the songs as they performed hit songs like 'Rhythm Ta' and 'Sinosijak'. iKONICs simply could not sit still because it was impossible, most of the time, they were at the edge of their seats. 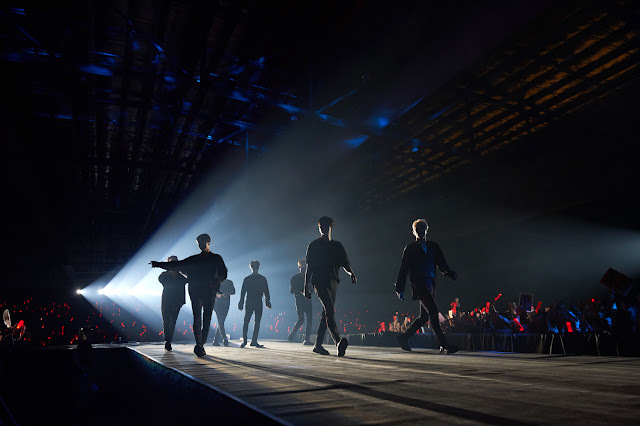 The hall was echoing with fans' voices harmoniously with iKON as they sang along to the songs. iKON greeted the fans and were thankful that they were finally back here. Unfortunately, they did not have time to travel around this time but they managed to dig into our local delicacies! Bobby knew that chili/butter crab was a famous dish in Singapore but he did not try it because he was not a 'seafood person' (how cute of him to share this fact)! Before moving on to their special prepared performances, they got the crowd swaying together for 'Cocktail' and 'Only You'. Bobby and B.I continued to entertain the fans while the other members prepared for their next stage. They had a mini-competition with the fans as they divided them into two teams - Team A(B.I) and Team B(Bobby). The fans had to sing to Love Scenario and the loser had to proclaim their love for iKONICs in Singapore. Guess who was the winner! The highly anticipated special stages kicked off with the vocalists performing 'Perfect'. They delivered the soothing song, charming all the fans in the hall. iKONICs are definitely falling deeper in love with the boys. Bobby performed 'Tendae' from his 2017 solo album. Putting out his versatile role as both a singer and rapper, it seems like there's nothing this perfect man can't do. B.I then charmed the crowd with his 'One and Only', in regards to young fans in the hall, he censored the profanity along the sentence in the song. So considerative of him! iKONICs were grooving along and it was the best time to get all the members back on stage with 'B-Day'. This is a moment where we should party and pop the champagne! You can really feel their love as iKON tried to communicate with the fans in English. The members who were not as eloquent in English also attempted to express themselves. The members confessed that they had to emphasize on their articulation when speaking English or will risk getting dissed. They also teased each other on stage as they tried to get B.I to show off his muscles but failed to do so! It was time for the next performance as they got into pairs for the song 'Best Friend'. Bobby gave a hint that he prepared something special for this stage. Alas! Guess what he returned to the stage with? He was decked out in a costume as a character from League Of Legends - Urf, the manatee! Everyone broke out in waves of laughter as they tried to sing along as well. It was really a fun-filled night! 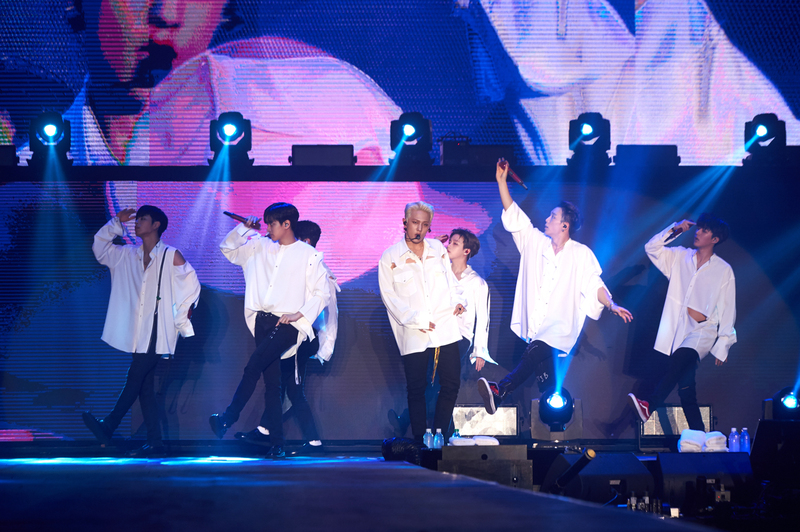 The entire concert arena sang along to the all-time favorite and catchy song, 'Love Scenario'. This song became a hit in Korea due to the popularity regardless of age. Kids were seen on social media singing to the song! iKON then moved on to charm the crowd with a few of their latest songs - 'Goodbye Road', 'Killing Me' and 'Freedom'. 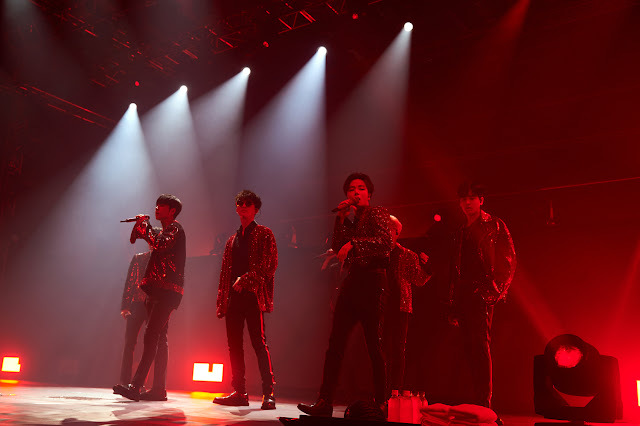 Just when we that that iKON would be back for an explosive encore stage, they teased the fans and said that they won't be back unless the responses for an encore were good! This bunch of cheeky boys! Despite teasing the fans, they returned for their encore stage, fans held the banner with 'We will protect you' on it. Jay then exclaimed loudly, "NO! WE will protect you!" (He meant that iKON would protect iKONICs instead..... how sweet of him!) And, we get a hilarious response from B.I saying "No, please protect me!" Their last attempt to get the fans up was when Bobby told everyone to keep their cameras away so that they can jump and party together! Fans were putting their hands up in the air and rocked together to 'Dumb and Dumber' and 'B-Day'. 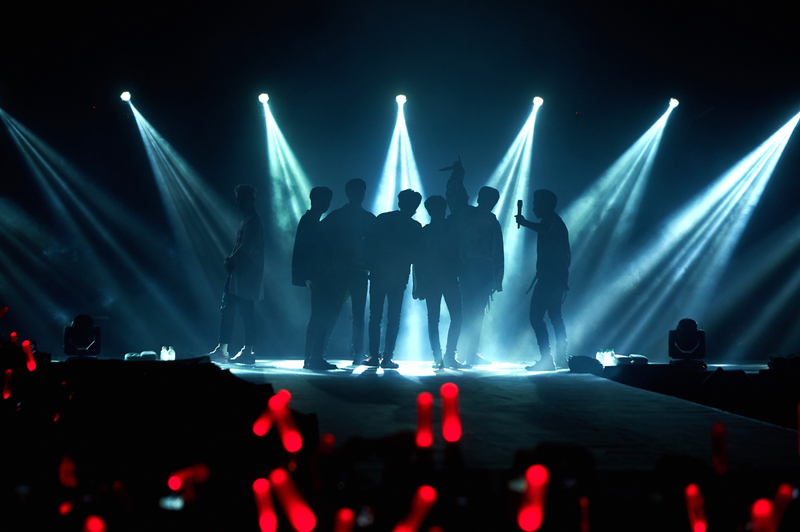 Now that the concert was approaching the end, iKON thanked their fans profusely and hinted that there would be a new album. I'm sure iKONICs would be waiting patiently for it. It was truly a night where we witnessed heartfelt moments. A magical combination of performances where we experienced an array of feelings. We would like to thank Unusual entertainment for the invitation.